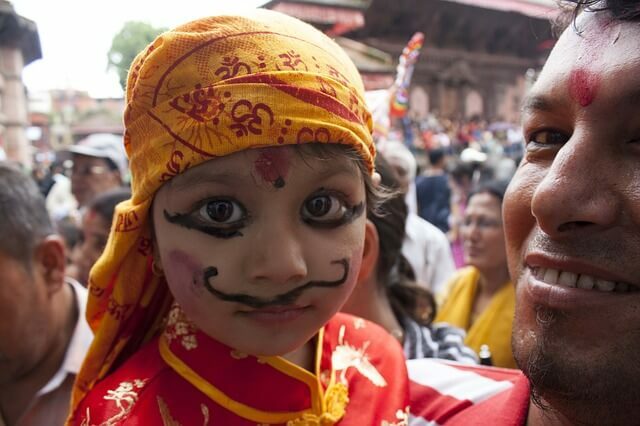 It would be an understatement to say that Nepal is rich in culture and diversity. This small mountain country is home to more than 125 different ethnic groups that come with their own set of language, tradition, and lifestyle. It wouldn’t be wrong to say that a festival celebration or a cultural procession is being undertaken at the time of me writing this or you reading it. Although the Nepalese calendar is dotted with festivals throughout the year, there are some festivals that are more reverent, significant, and elaborate than others. Here we have listed three upcoming festivals in 2018 that will help you get under the skin of Nepalese society and have a memorable time. Gai Jatra, which literally translates to “Festival of Cows”, is celebrated in the month of August in Kathmandu Valley and adjacent towns. The festival is celebrated in order to clear the route to heaven for a family member who died that particular year. On this day, a child presented as a cow, a decorated cow, or an ornamented chariot is taken for procession through old cities. Over the decades, the festival has also evolved as a day to address the shortcomings of the government, system, and the society in a satirical way. Different stage programs and standup comedy events are hosted on this day to address and ridicule the hindrances in the society. It also marks as a special day for the suppressed LGBTQ community to come out in the streets and parade proudly as who they are. Celebrated in September, eight-day long Indra Jatra is one of the longest and undoubtedly the biggest Jatra celebrated in Nepal. In simple terms, Jatra means a chariot procession of different gods and goddesses. Indra Jatra begins with the erection of a pine wooden pole at Basantapur Durbar square that attracts thousands of spectators every year. Some of the main attractions of this festival are ferocious Lakhe Dance; the elaborate dances of masked gods and goddesses; and the chariot processions of Kumari, the living goddess. The sheer sight of the medieval palaces and shrines aglow with the dim golden light of old wicks during the festival makes the vicinity and the experience even more amazing. Dashain and Tihar are two different festivals celebrated around 15 days apart but are jointly known as the biggest festival for the Hindus in Nepal. It is celebrated by all Hindu ethnic groups across the country. These month-long festivals normally fall between October-November, with everything from businesses to administrations closed for a few days to mark the celebrations. While Dashain is celebrated to mark Goddess Durga’s victory over a demon called Mahisashur, Tihar is celebrated to mark the victory of Shree Ram against Ravana. If you plan your trip around Dashain and Tihar, you will have the wonderful opportunity to witness the true magnificence and splendor of Nepalese culture. You will also be able to experience the warm hospitality of Nepalese people who will be very happy to make you a part of the celebrations.